These pictures are just a few taken from a larger collection of photographs that have been circulating via e-mail. For those who have not yet seen, they are a little disturbing but should serve as a stark reminder as to why coyote populations must remain in check. Maine sportsmen lets do our part by breaking out those deer rifles and giving the coyote populations a little bit of hell this holiday season! MAINERS Coyote Night Hunting Starts TONIGHT! You betcha! There is NO other way!! The most disgusting I've seen are coyotes eating a calf as a momma heifer struggled to have a twin & then ate out the back end of the momma & left she " the second calf to suffer & die. DISGUSTING! I took no photos & hope no one has to see such a thing. Coyotes are filthy, rotten critters. Do your best to control the population. Outfitter, Headed out this morning and within 15 minutes called in a yote. Only problem, thick cover and no shot. Can't wait for the water to ice over to provide me with the advantage! I just mounted a brand new Pentax scope (4-16 X 50MM) onto my 7MM WSM. Pointerman, I have been calling in yotes about every 4-5 times out. Just not open enough on my property for a descent shot opportunity. Would love to get out on the barrens or a frozen lake where I can test out the long range capabilities of my .223. I picked up a Caldwell Bipod . . . basically same as Harris only cheaper . . . worth a look. Truckless until after New Years it appears but should be up in your area perhaps in March?!? I still think you should come down for Feb 18th Pike Tourney! Saw this a few weeks back. 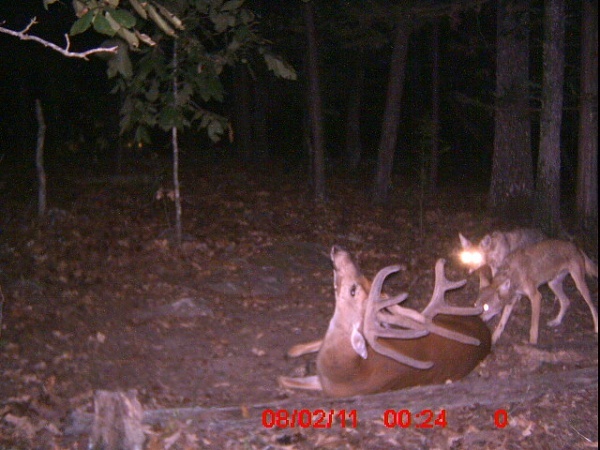 Photos were taken in Texas...It's crazy to think that they can take down a full grown deer. 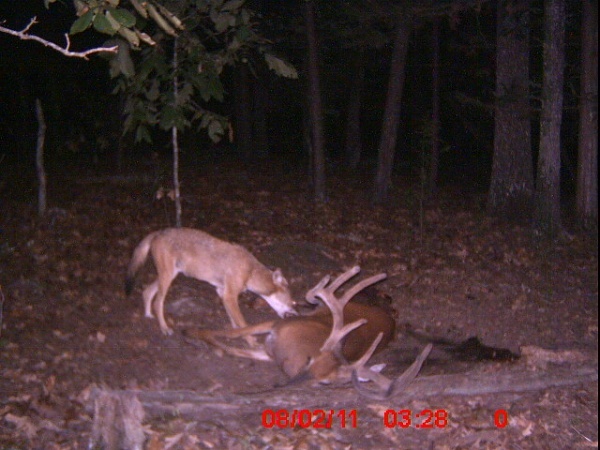 I start working on a study on Whitetail mortality with and without coyote control this upcoming spring. We'll see how it goes! I have never had the opportunity to shoot a coyote but if i had those pictures would be my reason why. Alex, I have heard that they just pick at a deer until it slowly bleeds to death and finally can't fight back. By the look of the deer in the picture it appears to have suffered several bad bites before finally dying. Not a pleasant way to go far any creature. Look forward to hearing more about your study! Rick, I bet we can make a coyote killer out of you yet! Erin, I am heading over to your blog! Sounds interesting! Jeeze...Yeah, whenever I hunt my buddy's property up in the mountain he tells me to drop it if I see one..."don't even think about it, just put a shot on it." he says. Tom, I just started seriously hunting them and can attest that it is a ton of fun. There is nothing more exciting then seeing them creep into a bait site or circle you when your calling. Adrenaline ride! My trigger finger is starting to get that itch. Time for some yotes to die! Trey, I hope to have the energy tonight to go out and sit on the bait site for a coupe hours . . . its about 15 degrees out today so will wait and see! Damn it is hell to get old! Wow! I wouldn't have thought they could bring down a healthy adult deer. I always thought the fawns were only vulnerable to yotes. Thanks for posting up. Makes me want to head back out to predator call. I only got 3 this fall, but it sounds like there are hundreds of them at night when I am camping out. 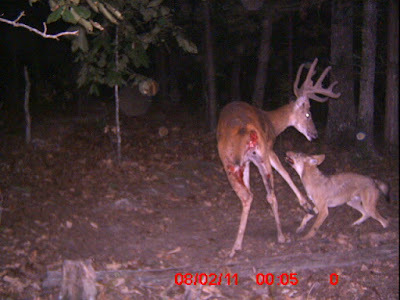 Most likely that buck was not healthy. Normally predators go after the young, sick and old. That is...the weaker ones. I had a coyote track me for over a mile, while I was deer hunting this past season. I am pretty sure that he eventually figured out that I was OLD and SICK and not worth eating. LOL! Anon, .223 is a fantastic round for yotes! Keep me updated through the season on your progress. I am now hunting them heavy in central Maine and it would be interesting to see how others in the state are doing. What do you guys do with coyotes you've killed? Never been huntin for them but thinkin about going out.. I don't like to waste anything I have shot . . . I haven't quite developed the stomach power to actually "eat" an entire coyote carcass BUT I do pelt all of the coyotes I shoot and tan the hides myself. I have a long list of people who want hides so it is never a problem getting rid of them! Okay, I am confused. 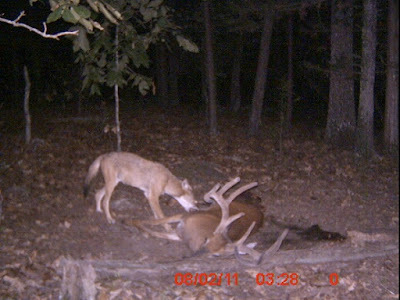 Seems to me these coyotes are killing the animal so they can eat it. Okay, so they don't use guns to keep things tidy, but isn't that why we're out there shooting the deer? To eat them?? Hi Elizabeth! Thanks for jumping into the fray and offering your opinion! I completely agree with you and recently had this same conversation with a friend. Coyotes are simply trying to survive out in the Maine wilds and they do that by killing and eating deer, rabbits, partridge and other game animals. To "vilify" them for these actions really doesn't make much sense as we as hunters do the exact same thing. The issue exists because coyotes kill A LOT of these game animals and are not tied to obeying game laws like we are as humans. The relative health of the Maine coyote population (btw they are an invasive species and were never here in the state until the 1950s) has caused our deer populations to suffer. By helping to eliminate a few coyotes here and there it helps us to believe we are supporting the Maine deer population . . . AND on a small level maybe we are. The problem of course will always be that no matter how many coyotes we try to kill, it will never be enough to effectively control their population, they are simply to numerous and widespread. So the Hunters were out there to cuddle the deer??? Circle of life. You're right, the coyote's range has expanded. This is mostly due to the wipe out of wolves and bears on the east coast. They were the dominant, larger predators and now the coyotes have filled the void. The number of coyotes has also expanded. This is because the more we kill, the more their numbers increase because a reduction of numbers causes the females to give birth to more offspring. Down here in Texas, we see something similar with the white tailed deer. Normally, the females don't produce as many offspring during a drought. Yet, when fed by "bambi lovers" during a drought, the females give birth to more fawns. It's survival at the genetic level. Back to coyotes, all these killings result in fewer older coyotes and more young coyotes. Besides greater numbers, this also means there are a whole lot more inexperienced coyote hunters. Hence messier, bolder kills. 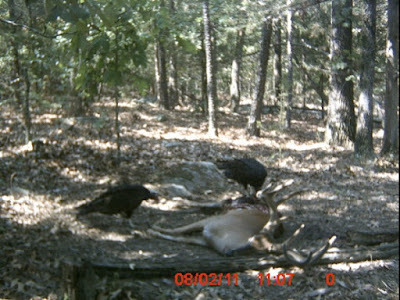 And more ganging up because they don't know how to make it alone...which is also how they historically hunted. If you're going to be shooting coyotes, it would be best to target the young ones and protect the older ones. It will take a few decades, but balance can be restored.